The year 2017 has been considered as the base year for company profiles. In cases wherein information for the base year was not available, years prior to it have been considered. Various secondary sources such as Factiva, Hoovers, and Manta have been used to gain insights into the GFRG market. Experts from leading companies manufacturing GFRG have been interviewed to verify and collect critical information and to assess trends in the GFRG market during the forecast period. Top-down, bottom-up, and data triangulation approaches have been implemented to calculate exact values of the overall parent and each market sizes. The market for GFRG has a diversified and established ecosystem comprising upstream players, such as raw material suppliers and downstream stakeholders, such as manufacturers, vendors, and end users of GFRG as well as various government organizations. Leading players operating in the GFRG market include USG Corporation (US), Formglas (Canada), CertainTeed (US), American Gypsum (US), Knauf Danoline (Germany), Saint-Gobain Gyproc (France), and Georgia-Pacific (US). This study answers several questions for the stakeholders, primarily, which market segments to focus on in the next two to five years for prioritizing their efforts and investments. This research report categorizes the GFRG market based on type, application, end user, and region. It forecasts revenue growth and analyzes trends in each of these submarkets. The GFRG market is projected to reach USD 3.44 Billion by 2023, at a CAGR of 7.0% between 2018 and 2023. The growth of the GFRG market can be attributed to the increasing use of GFRG in construction activities, owing to their exceptional properties, such as aesthetic appeal, sound absorption, fire resistance, moisture resistance, and rapid construction. 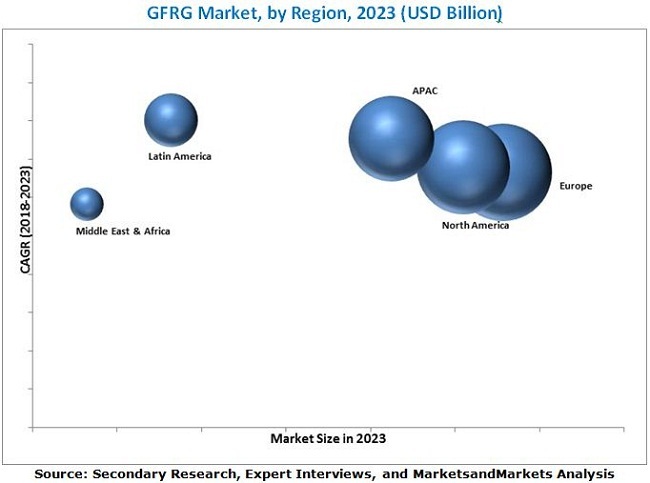 The GFRG market has been segmented on the basis of type, application, end user, and region. Based on type, the GFRG market has been classified into Type X, Type C, and others. The Type X segment of the GFRG market is projected to grow at the highest CAGR during the forecast period, in terms of value and volume. Type X is the most commonly used material for the manufacturing of GFRG, owing to its easy availability, good temperature resistance, and low cost. The growth of the Type X segment can be attributed to the increasing adoption of Type X gypsum board in several construction projects, owing to their properties such as high strength, good temperature resistance, and rapid construction. Based on application, the GFRG market has been classified into interior and exterior. The interior segment is expected to lead the GFRG market during the forecast period, in terms of value and volume. The growth of the interior segment can be attributed to the ability of GFRG to be used as loadbearing walls, partition walls, and others, which are economical. They are used in both residential and non-residential buildings. Based on end user, the GFRG market has been segmented into residential and non-residential. The non-residential end user segment is projected to lead the GFRG market during the forecast period, in terms of value and volume. The growth of the non-residential end user segment can be attributed to the increased use of GFRG in non-residential buildings, such as offices, institutes, hospitals, gymnasiums, cinema theatres, museums, and auditoriums. Europe is the largest market for GFRG, in terms of value and volume. The growth of the GFRG market in Europe can be attributed to the presence of leading GFRG manufacturers, such as Knauf Danoline (Denmark), Gillespie (UK), and the growth of the building & construction industry in the region. 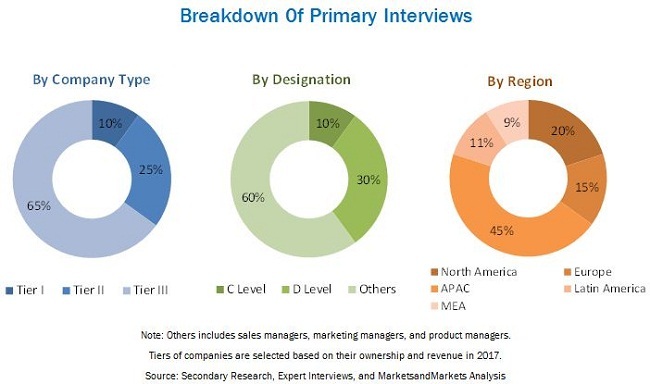 The GFRG market in MEA is projected to grow at the highest CAGR from 2018 to 2023, in terms of volume and value, owing to the increase in the number of construction activities in this region. The high capital requirement for transportation of GFRG on the top of buildings to build high-rise buildings act as a key restraint for the growth of the GFRG market. Formglas (US), USG Corporation (US), Chiyoda UTE (Tokyo), Continental Building Products (US), CertainTeed (US), Knauf Danoline (Denmark), Saint-Gobain Gyproc (France), and Georgia-Pacific (US) are the key players operating in the GFRG market. These players offer a wide range of GFRG to strengthen their competitive position and cater to the growing demand for GFRG from the building & construction industry. Knauf Danoline (Denmark) is a major player in the GFRG market. The company is focused on expanding its product portfolio and gaining a competitive edge over other players in the GFRG market. 11.8 Yingchuang Building Technique Co. Ltd.
11.9 FACT - RCF Building Products Ltd.
11.13.1 Shanghai Chuncui Decoration Material Co., Ltd.
11.13.5 Chiyoda UTE Co., Ltd.
11.13.7 Horizons Industrial Development Co. L.L.C.